Flash is finally really enjoyable! Well, at least for the past couple issues. We finished up the storyline with Fuerza on a nice note and we jump into a villain hideout country of Zandia. 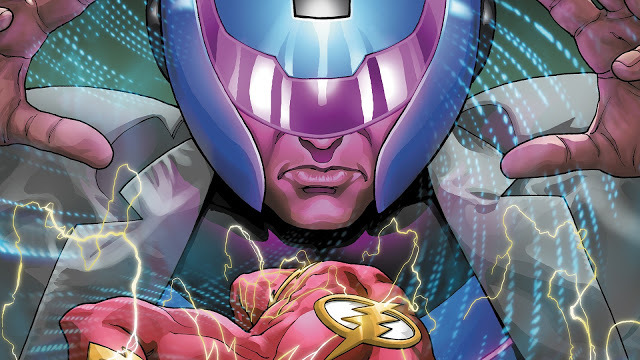 Flash encounters the Sage Force user that he has been searching for and finds out that he is not a foe but rather a friend. I’m hoping that we will get something similar to what we got with Fuerza. Obviously, it should be different but I really enjoyed the team up and seeing Flash working alongside a different force user. I hope to at least get the same level of quality that we got in that storyline. Let’s jump into this issue and see where it takes us. The beginning of this issue plays out like a spy movie. We get the facts very fast. The Sage Force user, who is revealed to be named Psych, has targeted Roulette who has built a casino in Zandia and is profiting off of anyone that enters. She even allows people to bet on fights between heroes and villains. We learn about her security and that the mission is going down tonight. Psych reveals himself to be an agent of A.R.G.U.S. and that getting the secrets in Roulette’s mind is his ticket out of Zandia. Flash touches base with him about his intentions to learn about the Sage Force through him and then Iris begins poking him for information. Psych reveals his real name is Bashir and he uses his powers to show Flash and Iris his backstory. He nearly burned his entire home down when he got his powers in his sleep. A.R.G.U.S. saved him and wanted him to help them. Iris gets angry at Psych for the telepathic abilities being used without her agreeing. We learn more of Bashir’s backstory before Barry agrees to help him. Iris is worried about it but Barry insists that he and Bashir have a connection due to their force powers. Back in Central City, we see Commander Cold and Detective Burns chasing down a lead. They turn a corner and the man disappears before the duo fall into a trap door. Cold recognizes the place they are in and his eyes widen. Back in Zandia, Flash and Psych put their plan into action. Iris hangs back and chats Magpie up. Psych suddenly reveals the Flash to be, well, The Flash. This causes a major distraction. Thanks to Barry taking out the security, Psych is able to sneak up on Roulette and prob her mind for the information he is looking for. 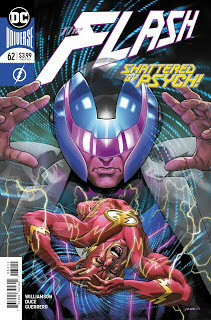 After dealing with the rest of Roulette’s gang and some other villains, Flash rushes out after grabbing Iris and Psych. Needless to say, The Flash isn’t too happy about things. Psych tries to turn it around and blame Iris but Barry isn’t buying that at all. Psych then pretends to surrender before using his powers to incapacitate Barry and Iris. Turns out Psych has been hired by Gemini to capture the Flash. We get some quick backstory about Gemini before the duo turns on Psych and begins to drain the force powers from Barry and Psych alike. This is where the issue leaves us. This issue was… fine. It was okay. Honestly a lot of things kind of just happen. We are immediately thrown into a casino heist which is cool but then it become very clear that Psych is shady and going to turn on Barry. It was basically an inevitability. Thus, when the betrayal happened, I don’t think any reader was really surprised. They could see it coming a mile away. Having him team up with Gemini was to be expected as well. Instead of a cool storyline like we got with Fuerza we get half an issue of something interesting and the rest is a lot of exposition. There are also a couple things that don’t really make sense but they’re nitpicky. I don’t really feel like getting into them but they also bogged down this issue. Overall, this is a major step back for a series that I was beginning to enjoy. Just when you thought the Flash was on an upturn, we get an issue like this. One that isn’t bad but isn’t good either. If anything, it was forgettable and that’s probably the worst thing that a book can do. A couple weeks from now, we may remember the bullet points but all the good will this book was building is lost again. I really liked Williamson’s run for a long time but now we are stuck on this quest storyline and I can’t be less interested. Ugh. Yup. The entire run has been just good enough to keep me buying it and shown just enough hope that it keeps disappointing over and over. But this whole other force stuff is not being done well. I’m it taking it off my pull list for the Batman crossover / Heroes in Crisis tie-in and I honestly don’t know if I’ll put it back on after that’s over.